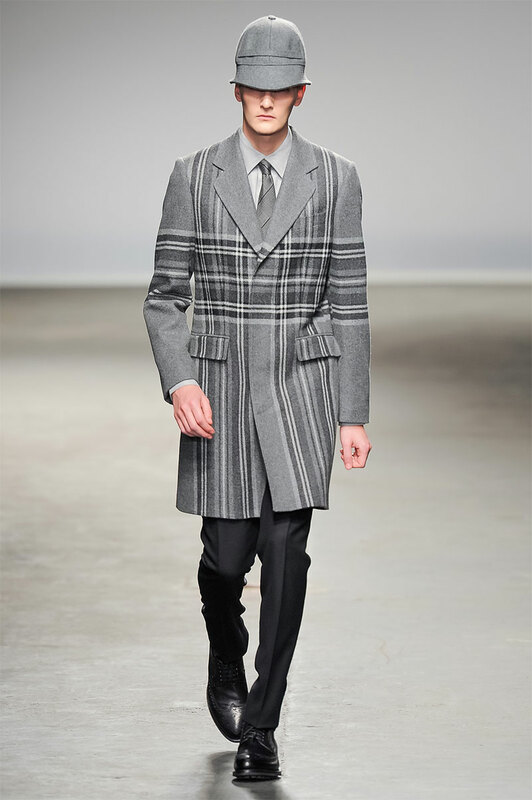 In the introductory words to his Autumn/Winter 2013 menswear collection for the label E. Tautz, Patrick Grant explained that he found inspiration in Scottish cloth vernacular, namely tartan, estate tweed and argyle. In addition, the checked tweed in a 1970s jacket discovered on eBay inspired the oversized scale of the seductive tartan used throughout the collection, in a move that mirrored Grant’s own appreciation of crystals viewed on a microscope. The collection’s 26 looks (shown on the runway during London Collections: Men on 9 January 2013) revealed a reassessment of scales and shapes of traditional menswear with extremely successful results. The colour palette focussed on black, white, shades of grey, and occasional dashes of navy blue, vivid orange and purple in fabrics where luxurious soft wool draped elegantly and sculpted graceful silhouettes. Trousers came in a variety of cuts, either flat-fronted, pleated, or as long breeches closed at ankle level by elasticated bands, whereas knitwear in geometric patterns evoked 1980s designs (an historical ambiance also evident in the runway show’s soundtrack, which featured songs such as Kate Bush’s ‘Running Up That Hill’ or Ultravox’s ‘Vienna’). However, it was the display of strong outerwear pieces that made this collection stand out for all the right reasons. 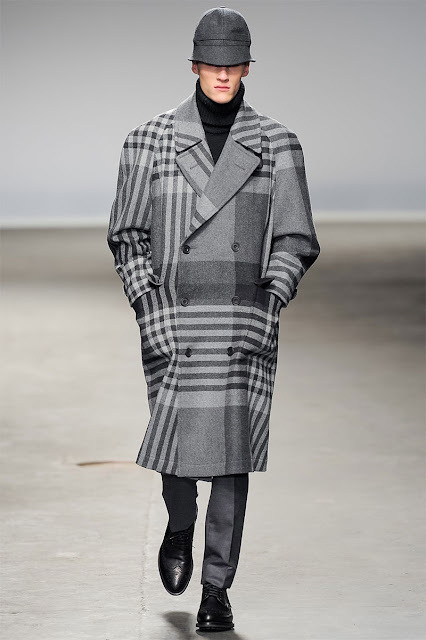 The design focus on jackets, trenches and overcoats is not unusual in E. Tautz’s collections, and the Autumn/Winter 2013 collection was no exception, with very successful garments such as wool trench coats in navy or black, double-breasted cropped jackets with wide and slightly rounded lapels, and raglan overcoats with patch pockets and angular shoulders that widened the torso in a flattering way. 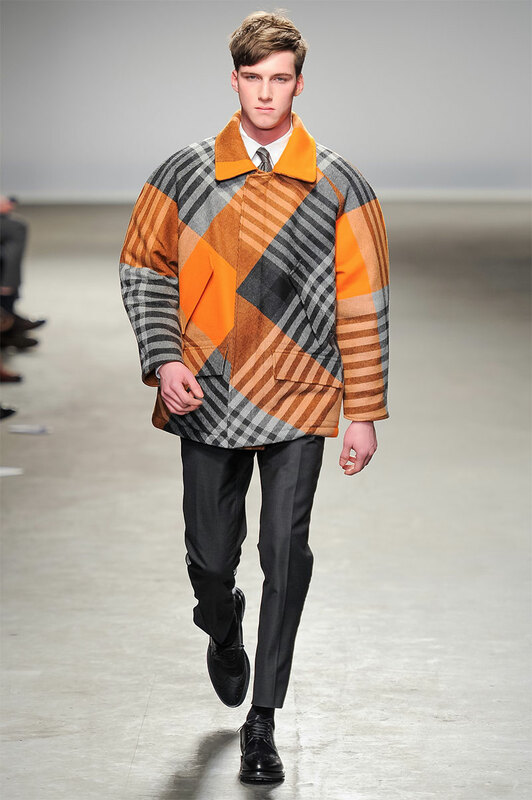 In addition, these pieces were made from fabrics with oversized tartan patterns in shades of grey, purple or orange positioned in a traditional vertical/horizontal format that sometimes alternated with diagonal layouts in a process that resulted in playful and exceedingly elegant garments. Overall, this was yet another outstanding collection for E. Tautz that confirmed Grant’s sartorial and business nous anchored on the appreciation of timeless sophisticated masculinity.